today. We’ve joined with the Auckland Regional Transport Authority (ARTA) to display schedule and stop information from Auckland's extensive bus network directly on Google Maps, as part of the Google Transit program. When searching for directions in Auckland, you’ll now have the option to view the public transit options available and compare these to the walking and driving options for various times of the day. For now, the service extends only to the network of bus services around the region, but in the coming months train and ferry information will also be available. We hope that this new feature will offer many time-saving benefits to Auckland commuters, including being able to select the quickest bus route available and pinpoint their nearest bus stop. And hopefully it will also encourage Aucklanders to think about greener ways of travelling and consider public transport alternatives when planning their journeys. 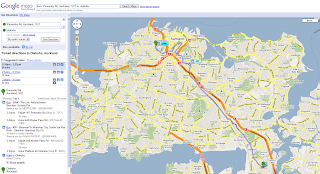 Earlier this year, Wellington became the first city in New Zealand to launch Google Transit. We now look forward to working with other transport agencies across New Zealand to bring the service to their cities. Auckland commuters must be among the most polite in the world. I've lived in a few different cities now, and I'm still not used to Aucklanders unfailingly thanking their bus drivers when they exit the bus. It's wonderful to see! Hopefully we'll see a few more well-mannered Aucklanders using public transport next year, thanks to the launch of a new feature on Google Maps today. We’ve joined with the Auckland Regional Transport Authority (ARTA) to display schedule and stop information from Auckland's extensive bus network directly on Google Maps, as part of the Google Transit program.